Lakeside Shakespeare: The Show Goes On! Lakeside Shakespeare Theatre proved that the show must go on, forced by rain to move their production of The Comedy of Errors to Oliver Art Center for a night. OAC executive director Steve Brown answered a 6 pm call on Sunday, July 28, from Amy Daniels Moehle, director of community development, asking if LST could move their rained-out show to the art center by 7 pm. Twenty-five actors and a crew of one dozen people moved within the hour and performed the play for a crowd of 50. 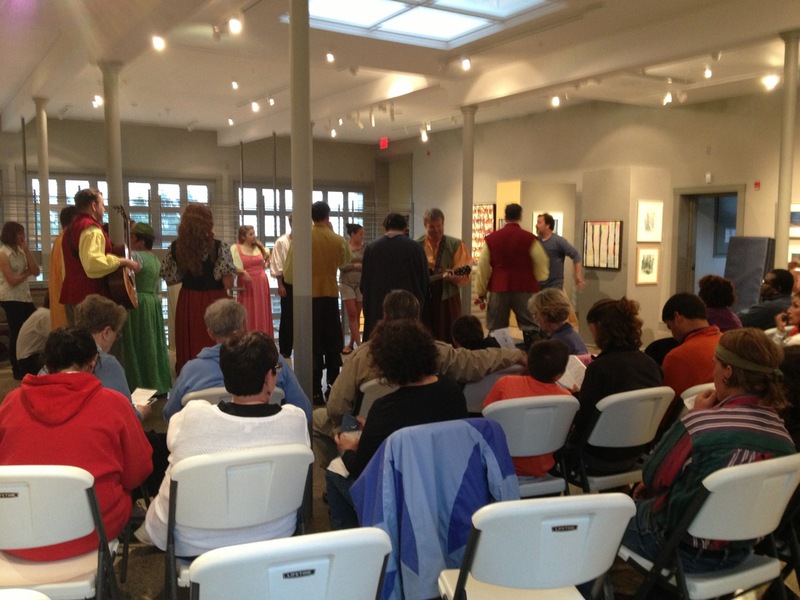 The Comedy of Errors, forced by rain from Tank Hill, found shelter, and its game audience, at the Oliver Art Center Sunday night. The LST ensemble is a team of talent from Chicago committed to bringing the bard to Benzie County for the past ten years. This anniversary season has tested the stage crew—with more rain than in any other season. In fact, they ended up rescheduling a show for the first time in their ten year history, after the downpour of Friday the 26th. Patrons were treated to a one-of-a-kind theatre experience at OAC. “We appreciate the creativity of the company and support of the community,” concluded director Scott Cummins. And the show did go on. Tonight, July 29, enjoy the rescheduled performance of The Comedy of Errors on Tank Hill. If you’ve missed the shows there is plenty of time to catch Romeo and Juliet or The Comedy of Errors in their newly updated amphitheater on Tank Hill in Frankfort through August 2. Visit lakesideshakespeare.org for all the details.